Being in two places at the same time sounds like a superpower – but being in two times at the same place is an everyday experience for historians, documentarists, and frankly anyone with a memory or a hope for the future. 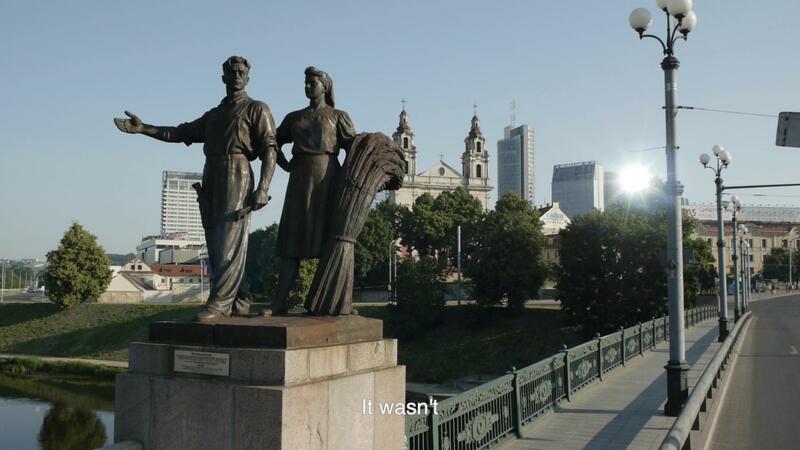 Lithuanian artist Deimantas Narkevičius, originally a sculptor and now renowned for his films, extends this idea with deeply resonant demonstrations that there are always several views of any story, that history repeats, and that time is anything but linear. The exhibition Doubled Youth relates this to the post-Soviet transition in the Baltic States and to relics of the Cold War, and is serendipitously overlaid by recent additional ironies arising from the Brexit vote and escalating tensions between Russia and the West. Following also this year’s Rhodes statue controversy at Oriel College and the International Criminal Court’s decision that cultural heritage destruction in Mali constituted a war crime, BALTIC just happens to have chosen a perfect moment for the UK premiere of Narkevičius’s film 20 July 2015, which immerses us in the night-time removal of the last symbolic Socialist-Realist statue from the Green Bridge in Vilnius. The immersion is achieved by a consummate stereoscopic film technique and BALTIC’s trademark massive projection. Enthusiasts for this medium (and its challenging veracity-artificiality paradoxes) will love moving about the space with the activated 3D glasses, stepping in and out of the action. But the artist has chosen it as much for its limitations as its possibilities: the twin cameras’ immobility, necessary to keep them in synch, makes for a deadpan witnessing onto which many interpretations can be projected. We witness workers who are more expressionless than the figures in the statue they are dismantling, while the half-interested bystanders could each be reacting to some different event altogether. There is a dreamlike sense of space-time disjunctions, without the actual fault-lines being apparent. At ground level the weeds push and the hailstones fall, so time must be advancing – but then the TV commentator asks to do a second take of her lines, subconsciously hinting that it’s all about history repeating. (Then of course, in the gallery, the film repeats…). In the next-door room is Narkevičius’s twin-projection installation Books on Shelves and Without Letters, a video-collage of a young guitar band playing to a crowd of friends in a second-hand bookshop. This could be from a time when any such decadence was illicit, and the superseded Betacam suggests it was shot in the artist’s youth; but in fact it dates from 2013 and these are aesthetic choices. The décor and the music are historically ambiguous, while the books themselves (occasionally the focus of attention) have all had a previous life. In the midst of it all the band are neither symbols of a coming utopia nor of sentiment about the past, but are simply lost in their present moment of performing. All these temporal placings are therefore also a collage; and time itself is made into a largely fictional parameter. 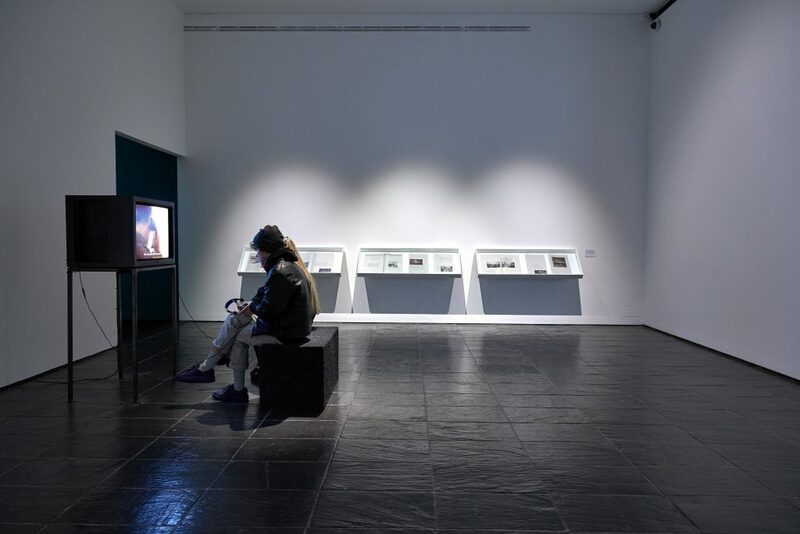 Other works in the exhibition include music and text relating to the rescue of vanishing Cossack song heritage, textless “newspaper” records of the Green Bridge statue removal, and The Dud Effect, a video from 2008 that listens to a former Soviet officer’s rote-learned missile-priming sequence. The latter is chilling now in its unexpected topicality (one “youth” we might prefer not to be “doubled”…). Cleverly, Narkevičius puts no central protagonists in his films to act as engines for narrative or to mediate the messages of history. That void (like the empty plinth where once there was a monument) invites a creative examination of what in fact makes the history. Is it a shared societal experience, or an individual one? With entire personalised environments (factual and fictional) now available to us everywhere on hand-held devices, has the answer to that question changed in a new way? With Doubled Youth, BALTIC has again mounted an important and compelling exhibition, which enables us to explore film as a “sculptural” medium, to make new parallels between the turbulent uncertainties of social change in the UK today with those experienced in other times and places, and to reflect differently on the very construction of experience itself. Doubled Youth continues at BALTIC Centre for Contemporary Art until 8 January 2017. Images: Deimantas Narkevičius, 20 July 15 (2016) Courtesy the artist, Maureen Paley, London; gb agency, Paris; Barbara Weiss, Berlin.